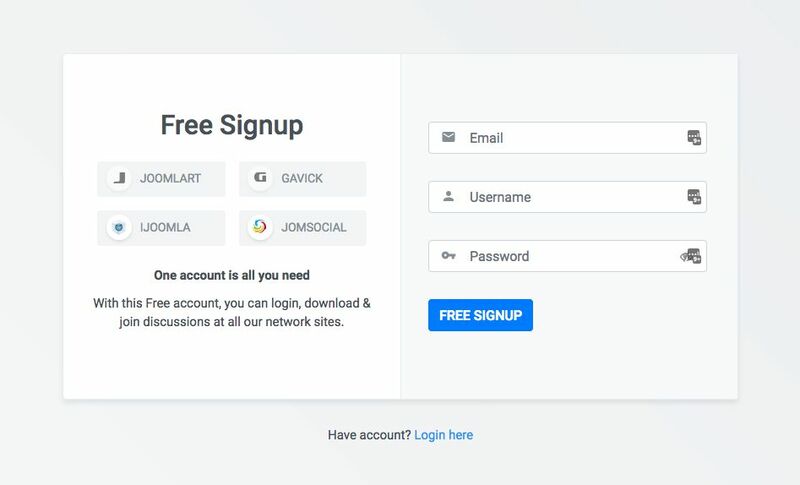 Two months into development and today we are happy to preview our new upcoming portal to provide highest possible user experience for all our members across JoomlArt, JomSocial, iJoomla, Gavick and JoomlaBamboo. Why need a new system? We acquired JomSocial, iJoomla, Gavick and now JoomlaBamboo over the last few months and now we have 5 different cart systems, support forums, ticket systems, download system. Out of which some are still Joomla 1.5 and some on Joomla 2.5. Old outdated scripts: Now we are using phpbb, kunena, kayako, rstickets, bbpress and 2 highly customized kunena across our network sites. There are extensions in use which are no longer supported and thus an upgrading nightmare. User data protection: It is very important for us to protect user data and with old outdated scripts in use across, we do not want to take any risk arising out of script exploitation. Cross-club access: It is not easy to provide cross-club access to our current members as they need to have different accounts at all sites. Flexible options: there is no easy way right now to provide our members benefits of all the mergers. For example, with the new system, one can get access to our other clubs by paying small upgrade fees, instead of buying new plan at higher price (which currently is the case). There are many compelling reasons that had us working on new system. Let me preview some of the features of our new system. One account to sign-in and access products, services and support. How Single sign-on is implemented? 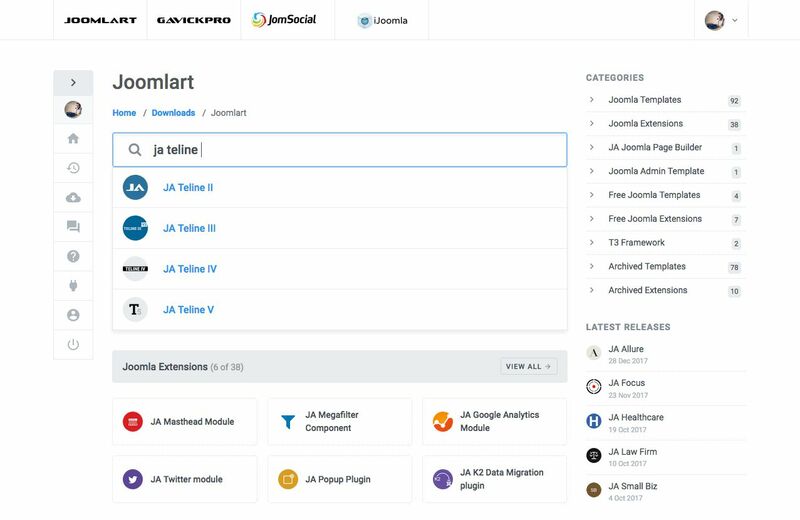 First the JoomlArt users are migrated to the new system. Next, for example, we import JomSocial users but we match the emails to see if the user already exists. If yes, then we import only the membership info. Same steps will be performed for each of the clubs. Simple and clean login / signup pages. View all your existing subscriptions at one place. Upgrade, renew, manage memberships for all clubs with easy clicks. Manage addons, offers and get the maximum out of your investment. Access unified download system to find any file you may be looking for. 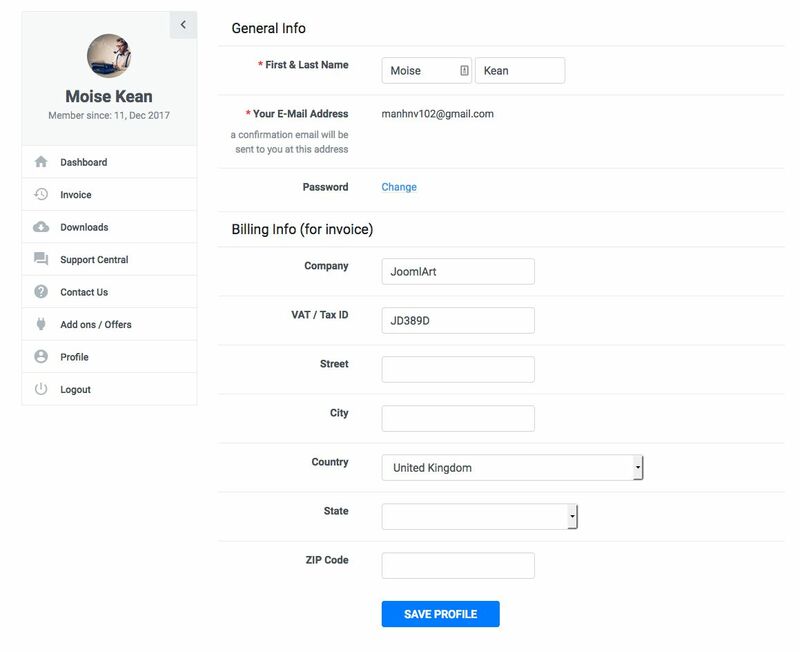 Manage profile, passwords, billing, invoices with simple clicks. Profile Edit: You can update name, password, email address and billing info. 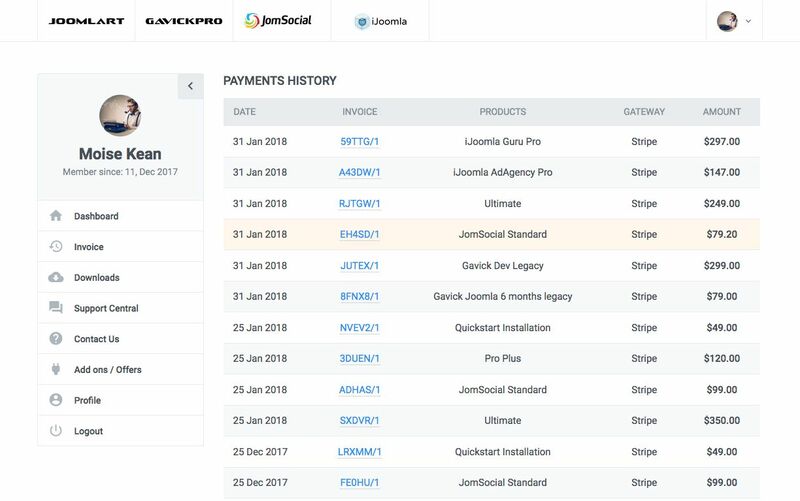 Invoice: View all subscription purchase history and invoice info. You can download invoice in pdf file format. This one is very important feature of the new portal. It will make your life much easier. Powerful search, this makes it amazing fast to find and download files. Efficient categorization. Just choose the club you want to access downloads and everything is neatly categorized there-in to make things easier for you. Download older versions, yes we already offer that on JoomlArt and we are extending this for all the clubs. It is now possible to download older versions too. Download single file or multiple files in one go. View update date, size and other important info related to products. 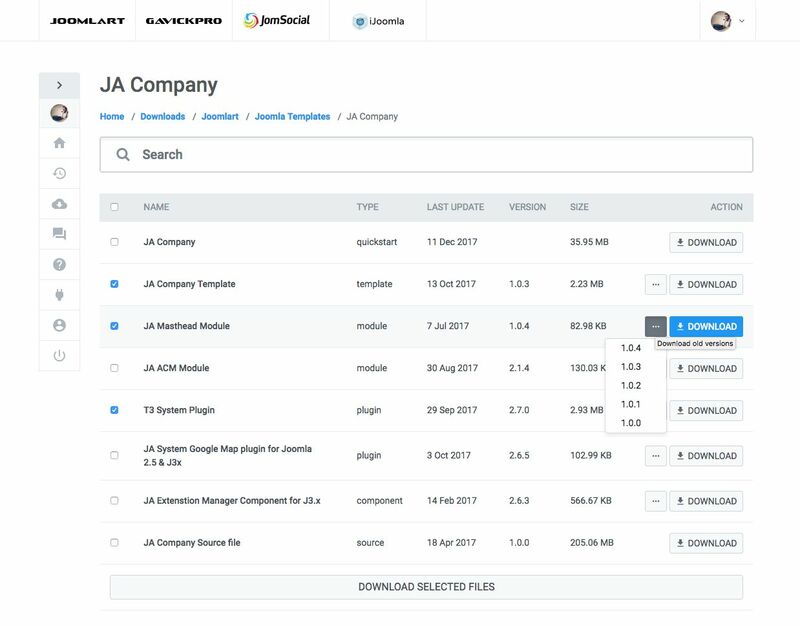 Select download category, or you can use search function to find the product you want to download. For each product download page, it has different files with detail info: type, version, last update. You can download old version of each file and download multiple files at the same time. One place to get support for all the clubs. Structure, categorization stays the same. More efficient support workflow, maximizes resource utilization. The system is now available on live site to test: https://www.joomlart.com/member/. Users from JomSocial, Gavick, iJoomla and Joomlabamboo will be migrated starting monday, 5th March 2018.. The new system will be officially live in the next 10 days. 1. 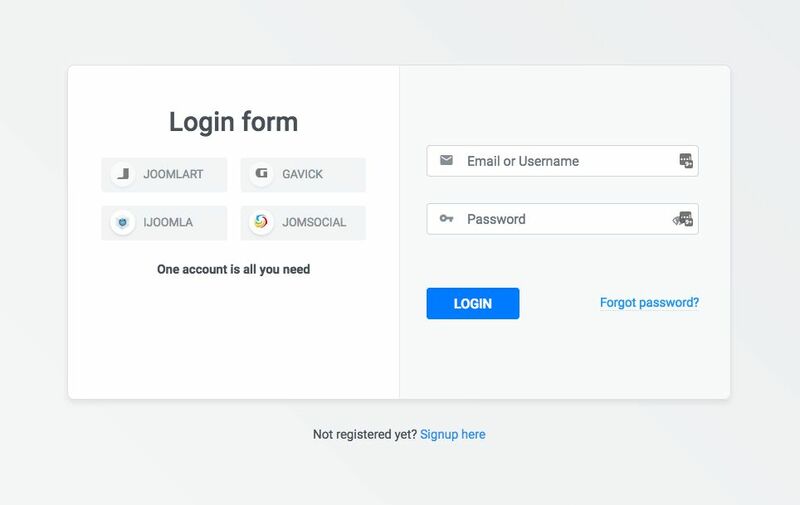 Only JoomlArt users can login to new system now. We are working on migrating our other clubs. 2. There is lots of testing data / text in the new system and this will be replaced with real data as we complete migrations. 3. Current system works well and the new system is for demo and feedback only.